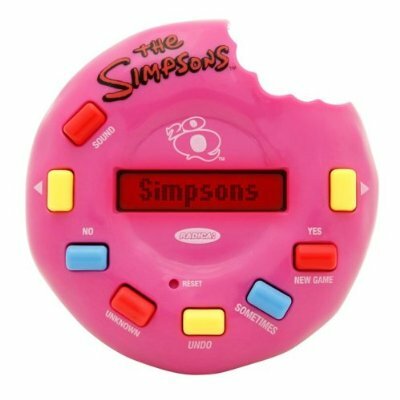 The Simpsons 20Q is the handheld version of Simpsons 20Q Online, and is a 20Q handheld based on The Simpsons. "Test your Simpsons knowledge and be amazed when 20Q Simpsons guesses what you're thinking. Think you know everything about Homer, Marge, Bart, Lisa and Maggie? Think of anything Simpson related, from the Springfield Nuclear Power Plant to Bart's infamous saying, "Don't have a cow, man!" Then answer twenty questions, and be amazed when The Simpsons 20Q guesses what you're thinking. This version of 20Q features a built-in light for day or night play and a trans-reflective screen for easy viewing. 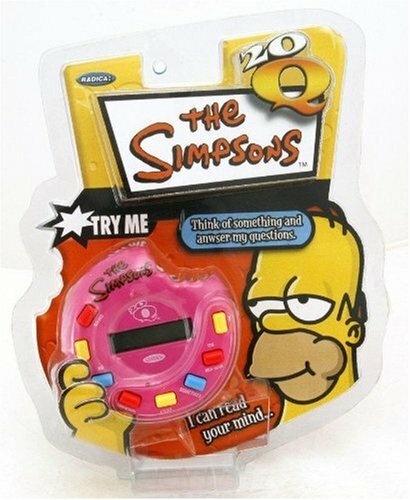 Even the biggest Simpsons buffs will need an extra doughnut to outdo 20Q. The perfect gift for any Simpsons fan." This article about merchandise is a stub. You can help Wikisimpsons by embiggening it. Modified on April 9, 2012, at 08:43.